A Solos favourite – we feature 3 of the best courses on the Costa de la Luz – a quality golf destination offering great value for money. Join us at the Isla Canela Golf Hotel, an intimate, friendly hotel, which has been receiving excellent reviews since its re-opening in early 2013. We will be playing 3 of our rounds of golf in Isla Canela, 1 round in Quinta do Vale and 1 round in La Monacilla. Come and join us at Isla Canela on the sunny Costa de la Luz. We will be staying at the Isla Canela Golf Hotel which has been receiving excellent reviews since its re-opening in early 2013. This small hotel has an intimate, friendly feel and is situated in the heart of Isla Canela Golf Course, where we will be playing 3 of our rounds of golf. The attractive peninsular of Isla Canela is on the Costa de la Luz in South West Spain. It sits right on the border with Portugal, and has a growing reputation as a golf destination. Set in pretty countryside, Isla Canela is a relatively short, flat and easily walkable course. It is a good test for golfers of all standards, with excellent quality greens and a number of interesting water features adding to its challenge. A wonderful new addition to the golf courses on the Costa de la Luz, La Monacilla is a relatively flat, easy to walk course which has been carved out of a local pine forest. Designed by Jose Maria Olazabel, the course lies in a tranquil, picturesque setting and is characterised by large greens, wide fairways and 2 spectacular lakes around the 2nd and 7th holes. The course has quickly earned an excellent reputation, and is a must play for any visitors to the area. Designed by Seve Ballesteros Quinta do Vale offers an interesting and testing round of golf to players of all abilities. It features 6 par 3’s, 6 par 4’s and 6 par 5’s and combines several tough dogleg holes with strategically placed hazards that will challenge even the best of players. Afterwards, the clubhouse is a wonderful spot for some post round refreshment enjoying panoramic valley views of the golf course below. 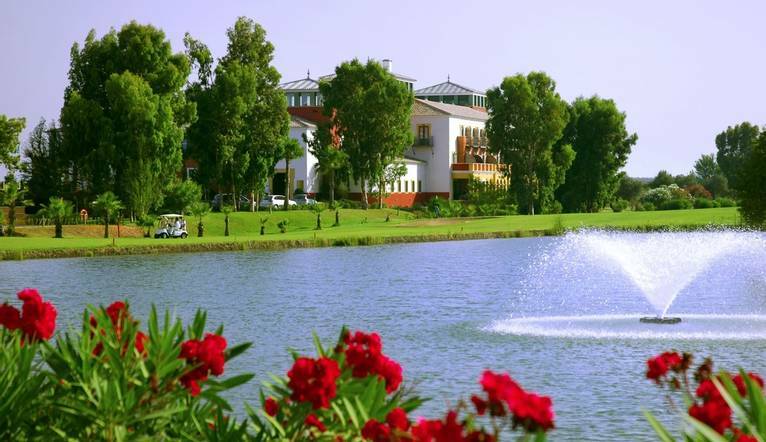 Surrounded by orange groves, olive and eucalyptus trees, and located right in the heart of the popular Isla Canela Golf Course, the stylish Isla Canela Golf Hotel is the perfect base for a peaceful, relaxing golf holiday. The hotel is designed in the style of the Portuguese Quintas and 18th-century palatial homes. Features include an outdoor swimming pool, bar, restaurant and cosy lounge area. All the rooms offer views of the golf course and have air-conditioning, hairdryer, telephone, internet connection, minibar and a safe. The transfer time from Faro Airport to the Hotel Isla Canela Golf is approximately 1 hour, depending on weather and traffic. We suggest a Group Collection to cover transfer drivers, and hotel staff of €15.00 per person. Your Tour Leader will collect this on your behalf and distribute it accordingly, thus relieving you of the burden of who, when and how much to tip. The tipping of housekeeping will be left to your individual discretion (a small amount left in your room on departure should cover this and would be much appreciated). As is customary, ‘the hat’ will be passed around for the driver and guide on all optional excursions. For any meals that are not included in your itinerary, or taxi fares, your Tour Leader can advise of an appropriate £ add on.